The lighthouse was built in 1875 on the island bearing the same name and is located in the middle of the Adriatic Sea, between the Italian and the Croatian coast. It is the most remote Croatian island and the lighthouse. It is situated 68 NM to the south of the town of Split and 26 NM to the south of the island of Lastovo. The island is 1400 m long and 300 m wide, and is covered by Mediterranean vegetation. The lighthouse is located 90 m above sea level in the central part of the island. There is a keeper at the lighthouse. As the lighthouse is located high on the hill, it is not recommended to older people and those not physically fit. The island is surrounded by nothing but the open sea which gives you an incomparable feeling of being separated from the rest of the world. The sea is very rich in fish. 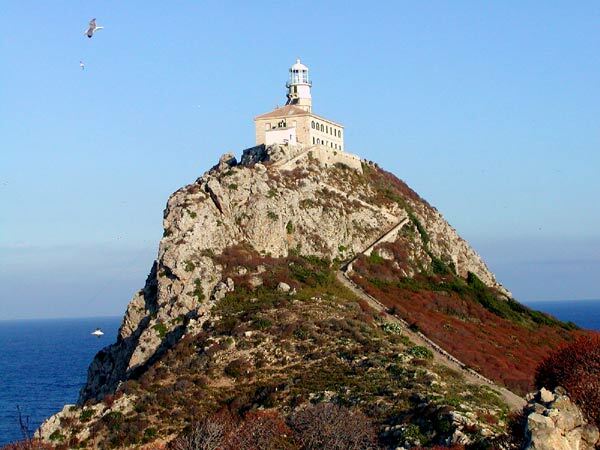 Did u know that Palagruža lighthouse is situated on an island rich in animal life, endemic plants, several archaeological sites and numerous stories and legends? With its two beautiful beaches, two long old paths and a lighthouse at its elevated central part, Palagruža is a true open sea island at ''the end of the world'', offering all the modern Robinson Crusoes a great escape from civilization. Legend has it that Greek hero Diomedes also found a refuge here after wounding Aphrodite and fleeing both Troy and her revenge. Archeological discoveries confirm this ancient legend, however due to heavy erosion, ''evidence'' for the other stories about the island lay somewhere at the sea bottom. Therefore we can only make guesses about a Roman temple and the other artifacts. On the other hand there are written records that Pope Alexandar III was on Palagruža. Spellbound by the beauty of Palagruža archipelago, the Pope changed its route and visited the island. A small plateau where he was served dinner on has ever since been called the Pope's Field.